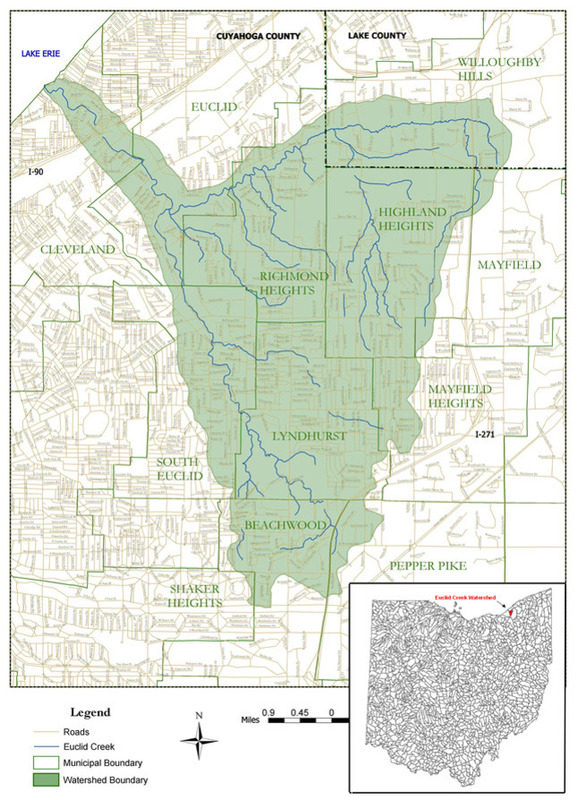 The Euclid Creek Watershed encompasses 24 square miles in northeastern Cuyahoga County and a part of Lake County. It covers portions of 11 communities, 10 of which are Cuyahoga County communities. Our program is supported by the efforts of the Euclid Creek Watershed Council, the Friends of Euclid Creek and the Cuyahoga Soil and Water Conservation District (SWCD). The Creek includes 40+ miles of stream, 30 miles of which is open channel and 10 miles of which is culverted or buried, as far as 8 miles away from the Creek's confluence with Lake Erie, our source of drinking water, at Wildwood Park in Cleveland. Euclid Creek is one of the most densely populated and developed watersheds along the Ohio Lake Erie coastline - which results in poor water quality. But we have a plan to restore the health of the watershed and it includes you, so contact us to find out how you can help Euclid Creek today!